At Acorn Glass we offer a durable, coated, neutral coloured, self-cleaning glass and, compared to ordinary float glass, it provides clearer vision during and after rainfall as well as requiring less frequent cleaning. It has good scratch resistance and durability, and in most circumstances can be treated the same as ordinary float glass. All self cleaning glazed units are produced in our Newport factory where we can produce units of all shapes, sizes and thicknesses to suit the frame in which it intended they are to be fitted, whether it is wood, aluminium, steel, uPVc or other and can be available within 5 days. It is available in a clear, blue, and neutral finish, which is a very light grey glass substrate. All that’s needed to ensure that Self-cleaning and Solar Control glass performs at its peak are the natural forces of sunlight and rain (or, in dry spells, a garden hose). Besides giving you cleaner glass, self-cleaning glass is better for the environment as there is no need to use detergent; so you’re doing your bit as well as keeping your home looking good. 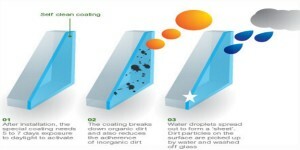 Under normal conditions the unique coating destroys organic contaminants and increases the water sheeting action on the coated surface. This allows dirt to be washed easily from the surface and should greatly reduce the need for manual cleaning. To ensure we acquire the best quality with consistent delivery, both Pilkington glass and Saint-Gobain glass are our preferred suppliers for self-cleaning and low E emissivity glass options. All self cleaning glazed units are produced in our Newport factory where we can produce units of all shapes, sizes and thicknesses with quick turnaround times. Self-cleaning glass is exactly as the name suggests – glass that keeps itself clean. It uses an organic process whereby dirt is broken down by daylight and is then washed away by rain. To Contact Acorn Glass & Glazing, please use the information below:. Call us on 01633 246050. © Acorn Glazing. All rights reserved.